Kaspersky Lab’s Anti-malware Research Team has detected one of the most dangerous Android banking Trojans ever seen. The Acecard malware is capable of attacking users of nearly 50 different online financial applications and services and is able to bypass the Google Play store’s security measures. During the third quarter of 2015, Kaspersky Lab experts detected an unusual increase in the number of mobile banking attacks in Australia. It looked suspicious and very soon it was discovered that the main reason for this increase was a single banking Trojan: Acecard. The Acecard Trojan family uses almost all the malware functionality currently available – from stealing a bank’s text and voice messages to overlaying official app windows with false messages that simulate the official login page in an attempt to steal personal information and account details. The most recent versions of the Acecard family can attack the client applications of some 30 banks and payment systems. Considering that these Trojans are capable of overlaying any application upon command, the overall number of attacked financial applications may be much higher. Google Play and Google Music applications. The malware was first detected in February 2014, but for a long period it showed almost no signs of malicious activity. 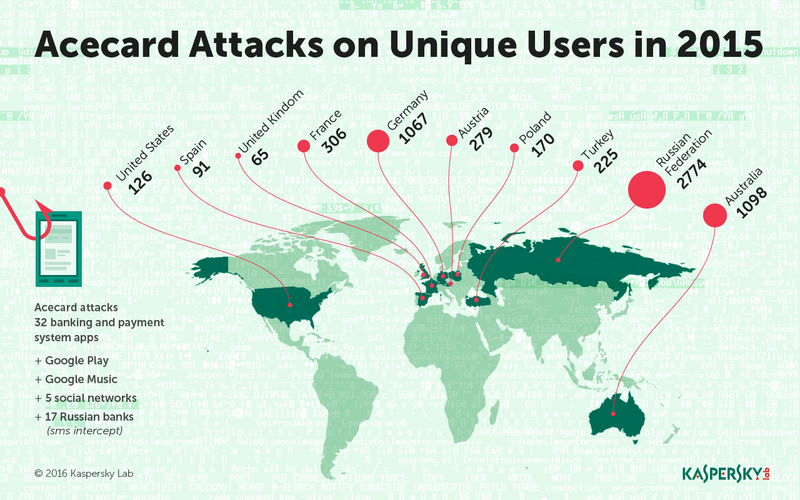 Everything changed in 2015 when Kaspersky Lab researchers detected a spike in attacks: in the period May to December 2015, more than 6,000 users were attacked with this Trojan. Most of them were living in Russia, Australia, Germany, Austria and France. But this is not the only way this malware is distributed. 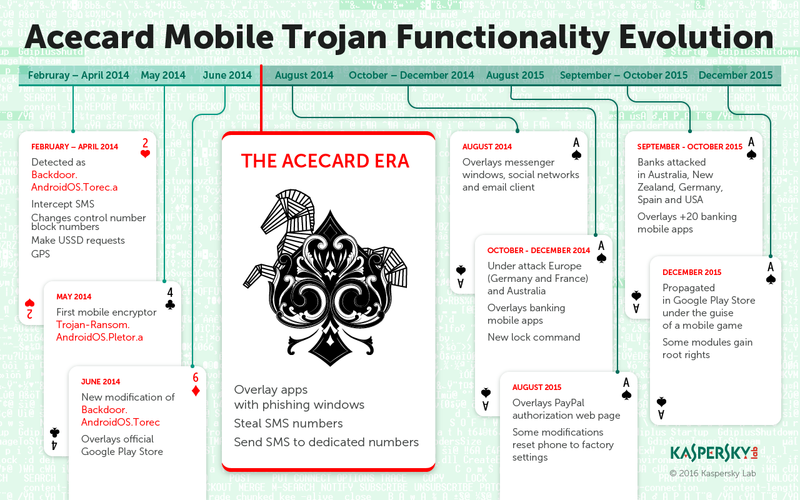 On 28 December 2015, Kaspersky Lab experts were able to spot a version of the Acecard downloader Trojan – Trojan-Downloader.AndroidOS.Acecard.b – in the official Google Play store. The Trojan propagates under the guise of a game. When the malware is installed from Google Play, the user will only see an Adobe Flash Player icon on the desktop screen and no actual sign of the installed application. Looking closely at the malware code, Kaspersky lab experts are inclined to think that Acecard was created by the same group of cybercriminals that was responsible for the first TOR Trojan for Android Backdoor.AndroidOS.Torec.a and the first mobile encryptor/ransomware Trojan-Ransom.AndroidOS.Pletor.a. The evidence for this is based on similar code lines (names of methods and classes) and the use of the same C&C (Command and Controls) servers. This proves that Acecard was made by a powerful and experienced group of criminals, most likely Russian-speaking. “This cybercriminal group uses virtually every available method to propagate the banking Trojan Acecard. It can be distributed under the guise of another program, via official app stores, or via other Trojans. A distinctive feature of this malware is that it’s capable of overlaying more than 30 banking and payment systems as well as social media, instant messaging and other apps. The combination of Acecard’s capabilities and methods of propagation make this mobile banker one of the most dangerous threats to users today,” – warns Roman Unuchek Senior Malware Analyst at Kaspersky Lab USA. Make sure that antivirus databases are up to date and functioning properly.